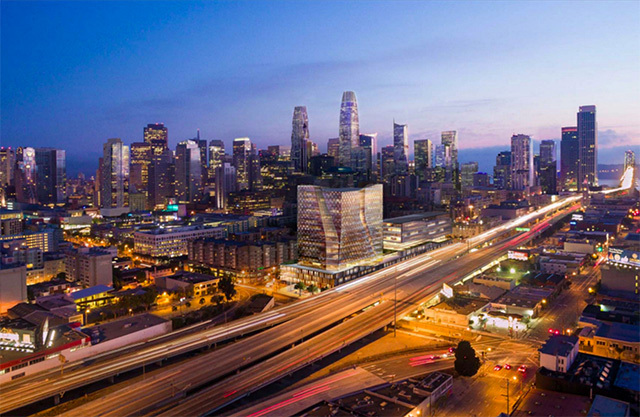 San Francisco continues to up its architecture game with some new renderings of a proposed HOK-designed 240-foot-tall office tower next to the freeway, on an industrial site in SoMa across from the Whole Foods at Harrison and Fourth Streets. The developer behind the project, as the Business Times is reporting, is Boston Properties, the same firm behind what will be SF's tallest tower, Salesforce Tower, currently rising out of the ground at First and Mission. It's a mixed use building that will likely have a retail component in the ground floor (currently allocated as 9,900 square feet), as well as a proposed 53,600 square feet of "flex" space on the lower level that is likely to be reserved for manufacturing, and a whopping 1.1 million square feet of office space divided between the tower and a mid-rise portion on the Third Street end. And the office space is something they're hoping to squeeze in before the city hits a 1980s-approved cap on office uses  on account of 1986's Prop M, an issue the mayor and Planning Department are hoping to solve by some funny historical math, without having to take it back to the voters. The proposed design is quite pretty, with a twisting, glazed volume of what appears to be a 14-story tower sitting atop a four-story podium, characterized by a diamond crosshatch pattern over the glass. According to plans by HOK Architects, the design tries to "accentuate the ‘elegant and sculpted’ impression of the tower portion both as viewed from the neighborhood and distance along the skyline... [And] the various carvings into the tower result in a mass that resembles several individual buildings, rather than a single monolithic tower." There has yet to be a full reckoning with the community, however, and SoMa activist John Elberling suggests that in addition to allocating more manufacturing space, he's hoping that the developer will carve out a 15,000-square-foot site at the east end of the parcel for affordable housing.